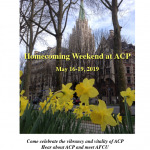 The American and Foreign Christian Union (AFCU) Organization exists solely for the purpose of supporting the ministries, in Christ’s name, of the American Church in Paris (ACP), the American Church in Berlin (ACB) and the Vienna Community Church (VCC). While this statement of purpose seems simple and straightforward, it does require further explanation. Selection, employment and financial support of the ACP Senior Pastor. Oversight of the buildings housing the ACP. Nurturing alumni support of all three churches. Managing all endowment funds within charter of a 501(c)(3) organization and approving appropriate grants. A Board of some 30 members currently serves the AFCU. All members volunteer their time, talents and expenses. They are comprised of alumni members and ministers along with current members of the three churches. The Board is further supported by volunteer consultants who bring a certain experience and expertise. In addition, there are the Pastors and ex-officio members from each of the churches. Finally, there are the Honorary Board members who wish to maintain close contact with the Board but who are not obligated to attend Board meetings. The organizational structure of the Board centers upon functional committees. At the present time the specific committees are; Executive, Financial, Personnel, Nominating, Development,Communications-Interpretation, and Audit . Under the auspices of the Development Committee there are various subcommittees established for each major development area. The current officers of the Board are listed as President, Vice President, Secretary and Treasurer. The Executive Committee consists of the designated officers along with Past Presidents, various committee heads and selected Board members. The role of the AFCU is to support the designated ministries, in Christ’s name, of the individual churches. It is the responsibility and mission of each church to define and carry out those ministries. Through grants from the endowment funds the Board can designate funding for certain areas. The Operating Budget for each church is the sole responsibility of the local church leadership and congregation. The main financial role of the AFCU is to manage and increase the endowment funds and approve designated grants. The key areas of collaboration between the AFCU Board and the local churches are through active development efforts and alumni support. This is being accomplished through specific functions of the Development Committee which include management of the alumni data base, regional ‘Friends” receptions, a newsletter, direct letters, planned giving (Heritage Society) and various other tools. 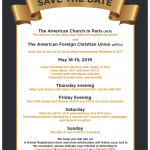 The mission of the American and Foreign Christian Union is to support the International, English speaking, ecumenical churches whose ministries bear witness to Jesus Christ. In partnership with our member churches, we will strive to develop and manage a strong financial base to further their programs. We will nurture and strengthen our alumni ties and lend support to the pastors, leadership and members of these churches through our care and prayers.